In rare cases when devices have been uninstalled incorrectly (such as by running the uninstaller by double clicking) and the host system has not had the driver removed properly, it is possible that the device cannot be reinstalled until the system has been cleaned up. A program has been written to remove registry entries and files relating to FTDI device drivers. The FT_Clean program generates INI files for the uninstaller appropriate to the version of Windows installed and runs the uninstaller for each INI file generated. No user input is required for the uninstaller to run. The program can be used to remove a single device, a consecutive range of devices or all devices with the same VID. A message box will appear to confirm which VID and PID combinations are going to be removed. A second message box will provide a final chance to cancel the uninstallation. The mouse and keyboard will be disabled for a few seconds while the uninstaller is running. 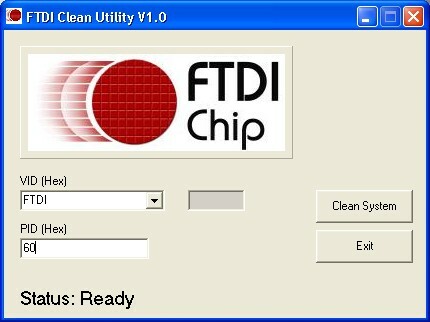 The example below shows the FT_Clean program configured to remove all devices with a FTDI VID and PIDs beginning with 60 i.e. all PIDs from 6000 to 60FF inclusive. A four digit PID will remove a single specific device while leaving the PID box blank will remove all devices with the same VID. Please note that the INI files generated will have the standard file names. As a result, any files that have been renamed will not be removed by the uninstaller but must be deleted manually or by another program.